Everybody living in India who has not been living under a rock for the past few weeks knows that a great debate has been raging about anti-nationalism and sedition, which had its birthplace in JNU university with the arrest of their Student’s Union president Kanhaiya Kumar. Unsurprisingly, students at Jadavpur University have stood up in solidarity with those demanding the release of Kanhaiya Kumar, and as a result the campus has been rife with discord and disharmony. In fact, students have become so preoccupied with the issue at hand that another landmark event has been nearly overshadowed. The department of history organized the first student’s seminar held over two days. This is remarkable not only because it was the brainchild of undergraduate students and organized by themselves, but also because I overheard out head of the Department comment that such a large-scale seminar is not even organized by the department of history in JNU, the most elite university of the country. 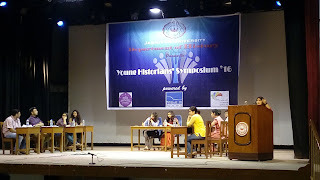 It gives me immense pleasure to claim that the Young Historians’ Symposium – as the seminar has been named by common consensus – was a success, and the response was remarkable given that it was the first time such a seminar was being organized by the department. Held over the 16th and 17th of February, we had paper presentations by students from various departments and institutions, and a debate to end with on the last day. Though it was nowhere near a full house, the audience that was present was still significant, especially since attendance was not compulsory. The kind of hard work and preparation put in by the participants was commendable. But I will come to this in a bit. For me, the success of the seminar brings pleasure on a deeper level. It is a sign of the enthusiasm and dedication of the students of the department, and the loyalty and love we have for our department despite the endless barrage of complaints and frustrations each one of us vents about it every day. The Economics department has been organizing their own students’ seminar for a number of years now, and the International Relations department also has numerous seminars each year. So it is good and right that the department of history should catch up in this regard, not least because it is a matter of departmental prestige and pride. I remember the first day we heard about the seminar. It must have been some time in October, or was it November? My friends and I were lazing about, as we do, after classes ended, when I suddenly got a call from a senior asking us to join a delegation from the department that was headed to the vice-chancellor’s office for a meeting. We had no idea what this was about, but the prospect sounded exciting, and ever since Hok kolorob visiting the VC en masse has became a statement of protest, an expression of independence in the minds of many, so we joined the group without much ado. 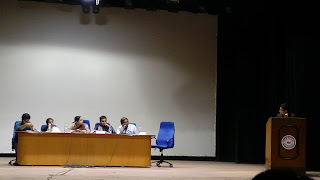 On the way we managed to squeeze some information out of those in the know: a departmental seminar was to be organized in February in Gandhi Bhavan, one of the auditorium halls in the university, and we were going to request (read coerce!) the VC into allowing us a waiver on the hall charges for the seminar. That sounded exciting, and I think mentally many of us prepared for a shouting match of sorts. That turned out to be completely unnecessary though, because the VC was happy to oblige. Mr. Suranjan Das, our present vice-chancellor, is himself a historian by qualification, and as soon as he heard our request he called up the exchequer and got us the required waiver. “Amar i department, eta kore dao” or something along those lines over the phone, and it was done. Thus the foundation was laid. For much of the last months of 2015 and throughout early 2016, the seminar was on the top of a lot of peoples’ minds. The idea had first been proposed by some students of the third year, and naturally they were the most closely involved. Since my friends and I have quite a rapport with some of them, we used to hear first hand news about the progress made and the obstacles faced by them. As is the case in every group, some people work themselves weary, others sit and enjoy the fruit. Those in the former category happen to be my friends, so I often heard them fuming about the attitude of classmates and others involved, the tendency to upstage each other and the unfairness shown by those in power. Hearing them talk about their troubles, I often wondered why they bothered to take so much responsibility in the first place, especially since it was such a thankless task most of the time. But I suppose some people cannot help it; they just have to keep at it, no matter what. Formal meetings about the seminar started taking place sometime in late October. Very few people from the first year were present. Nobody seemed interested in getting involved. The standard excuse was “We are just going to watch this year.” Be that as it may, a couple people, myself included, volunteered. In the first meeting the volunteers were appointed to specific committees. I was made part of the fund-raising committee. Somebody joked that I was now to be the official beggar of the class, chasing everyone for money for the seminar! There were about a dozen committees to begin with, ranging from abstract collection and report-writing to sponsorship and collaboration and food committees. More were added in later meetings – our HOD decided that a separate committee was required for serving tea during breaks! – and afterwards I was also made a member of the ‘flying squad’ to be in charge of the law and order situation during the seminar. Not that I had to do anything on the seminar days! But it was fun having my name on paper! The bit that I remember most clearly about that first meeting was the debate over what the seminar was going to be called. This was after the professors had left. The students gathered around in a tight circle and suggestions started flowing. There was more fooling around than anything else, but the common consensus was that the name should not be a repetition of the seminar names used by any other department, and also state clearly that this was an initiative of the history department. ‘Young Historians’ was almost agreed upon, but ‘Meet’ was clichéd, and so were some of the other terms suggested. Eventually the gathering broke up and the discussion was carried on to the Facebook page started for the seminar. 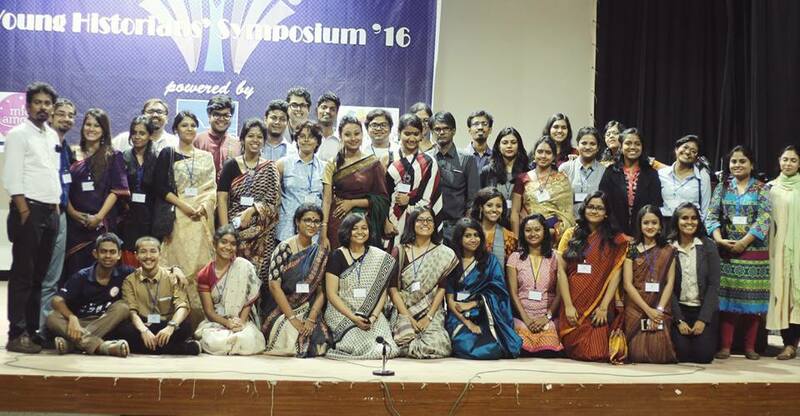 Travelling to Durgapur the next morning, the word ‘Symposium’ occurred to me. I suggested it on Facebook, and everybody liked it. So now I can claim with some pride that the seminar organized by the department has been named by me (though I try not to strut too much about it: this was a joint effort and my contribution was minuscule). I will not be going into the details of every single meeting; though all of them are a perfect mixture of exciting and hilarious in my mind, it will be a tedious narrative for the readers. Suffice it to say that we met a number of times over the next couple of months, and though I did not have much to offer during the meetings myself, I found it interesting to keep updated on the progress made in terms of paper submission and collaboration with other universities and arrangement of sponsorship and things like that. The one down side of the seminar though was that the seniors became really busy with all the preparations and could spare almost no time at all to hang out with us. I enjoy spending time with them, and so I missed that. And then, and then! Finally it was February the 16th. Actually, my friends and I had been all hyper for days before D-Day, planning out our attires to the minutest details (girls will be girls!). I must admit somewhat shamefacedly that on 16th I spent more time in front of the mirror dolling up than I usually do in a month. I was there at the venue by ten in the morning. A handful of the seniors had stayed back on campus the previous night to get things ready. It had been a busy night for them with little sleep, but my, did they look handsome that morning! Or maybe it was just me; all that departmental pride and loyalty was getting projected on the organizers. Anyway, we were soon inside the hall, and made ourselves comfortable in a nice shadowy corner. I had been given the responsibility to hand out food coupons to my classmates, but apart from that I had little to do, so I could very well concentrate on the seminar. On the first day there were three technical sessions, on local and regional history, state and warfare in history and society and culture from pre-modernity to modernity. There were five speakers in each session chaired by various professors of our department and other universities too. From the first session, my favourite paper was one on the cultural and religious elements in the making of Vishnupur in 17th century Bengal by two students of our department. The speakers were eloquent and delivered well-researched papers, and even had pictures to display at the end of the session. The speaker who eventually went on to win the Best Paper Presentation award was also from this session, a student from the Department of Sociology from Presidency University, who spoke the connections of the goddess Kali and the naming of the city ‘Kolkata’. Another very interesting paper was also delivered by a student from the same department, titled ‘The evolution of wrong: on the question of moral turpitude among the peoples of Bengal’. Though this paper was, unsurprisingly, more on the lines of a sociological discourse on gender roles in terms of the creation of various taboos in the Bengali society, it was a well thought-out presentation and very interesting. The next session, following a tea break where we were provided with food packets from the cake shop Mio Amore (a sponsorship that involved a lot of running from pillar to post, or so I hear), was the one on military history, and I must confess that I was not paying a lot attention during this. But the one paper that I listened to and found interesting was on non-state armed groups and their potential as state builders. The final session of the day was after yet another break, and this one was important for us, because we had a classmate presenting a paper in this session. Anwit Shahi from first year presented a paper titled ‘Protestant ideologies and statecraft – Ashoka’s Buddhism and Henry VIII’s Anglicanism’. He was wonderful, and this also happened to be the paper most understandable to the students of UG1 since the subject was close to what we have already studied. Apart from Anwit, there was also Anupam Da from the second year who presented a paper on cricket in colonial India, which was a hit among sports enthusiasts. That was where the first day ended. We went home tired but happy, though some of us got caught up in the protest that had been organized in solidarity with JNU that evening. Anyway, on to the next day. There were two technical sessions on the 17th, the first on environment, economy and society, and the next on women’s studies. I got caught up with some work at home that day, and so I arrived late and missed out on the sessions. I did not however miss the lunch box provided that day. This again calls for praise to the seniors, some of whom themselves handled the entire arrangements right from shopping for rations to distributing the boxes for nearly three hundred people. Post lunch, there was the debate – Dialectic – and the motion proposed by the house was ‘Donald Trump is a product of American racism, just as Hitler was a product of German anti-semitism’. 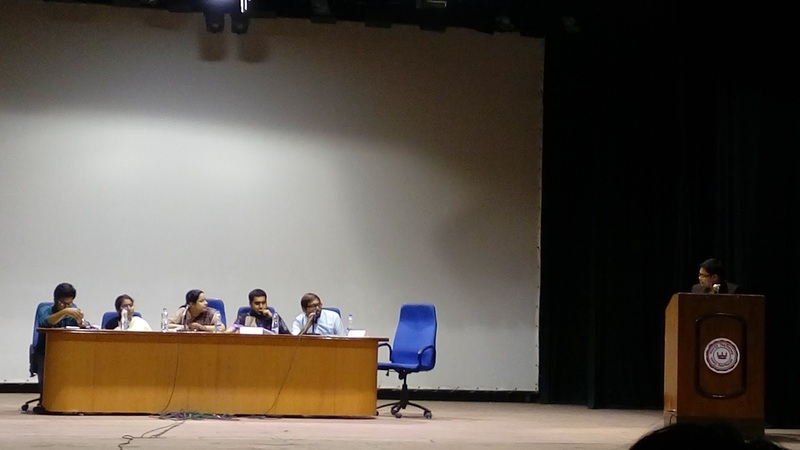 Two of my classmates – Manami Mondal and Annewesa Ghosh spoke against the motion, and both were very good. It was an interesting debate, and the coordinators did their job wonderfully. Eventually the majority of the audience as well as the judges seemed to be of the opinion that the arguments of the defender teams were stronger than the opposition. It was a fitting wrapping up of the seminar. All those months of preparation and anticipation, and it was over in forty eight hours! But they were a wonderful forty eight hours, and already I cannot wait for the seminar to happen again next year. The students of the department hope to make this an annual event, as with the Economics department seminar. Next time round, I hope to be able to take a more active part in the business of organizing the seminar. This time, my participation had been token at best. The one regret that I have is not being able to present a paper this time. This was because of some miscommunication towards the beginning, as I was under the impression that members of any committee were not allowed to present papers. When I found out I could in fact present one, there were hardly seven days left until the deadline. So next time I am most definitely presenting a paper; and now that I have a year to decide and work on a topic, there will be no dearth of time. The contribution of the third year students was phenomenal, as it was they who did practically everything, right from coming up with the idea of the seminar. Dipro da and Vishal da deserve a special mention – they looked after almost every aspect of the seminar. Of course were many others too, whom I would have mentioned by name if I knew them! As it is, the JU Young Historians’ Symposium is now a reality, and will, God willing, continue to take place every year and benefit students of every batch to come. To think that we were there at the start!...just suppose I come to attend one fifty years later?